Joseph Beuys died in 1986 at the height of his reputation – in the UK at least, partly as a result of the German Art in the 20th Century. Some thought that his work might fade without his charismatic presence, but he still seems to be at the top table. There is a show now at a new space called S2, or S|2 even – part of Sotheby’s functioning as a ‘selling exhibition’ rather than an auction. It showcases a small number of high quality smaller works by Beuys and has a film of his wonderful, crazy and iconic performance ‘How to Explain Art to a Dead Hare’ in St George Street just off Hanover Square. The smaller works are on paper and very collectable. Once your eye had tuned in to the eccentric way Beuys draws, they are very pleasing to look at. He is one of the handful of 20th Century artists who could use animals as a theme in his work without it seeming contrived and irritating. 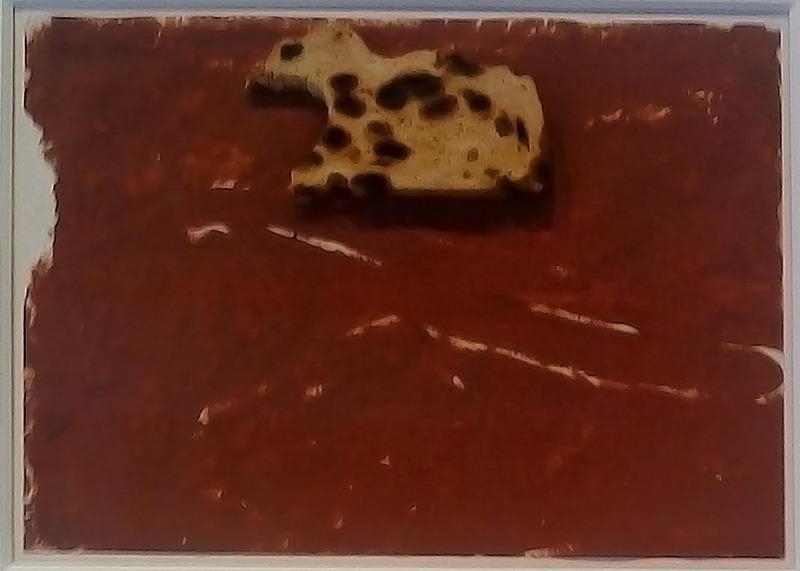 In one piece he uses a slice of raisin bread to suggest a jackal over a ground of his favourite brown floor paint. The slightness of the actual piece of bread on a piece of paper delicately invoking his absolute relation with nature in all its forms. A contrast to the many overblown canvasses with animal themes, mostly done by artists who are tourists in the natural world. In the last space there is the film of How to Explain Art to a Dead Hare. Beuys mutely ushers the dead hare, which is really quite large and really really dead around the gallery. I had only ever seen one still image of this performance before. The film is arresting – it is small scale, there are some people in attendance though not many and you see them in their dated clothes and hairstyles outside the door, outside this holy moment. Although the film is in black and white, the gold leaf on Beuys’ face has a metallic sheen and he does have a shamanic intensity, his clear blue eyes for once in deep shadow and unreadable behind the mask. In a way the performance can seem like an ironic prophecy of the rise of the priesthood of critics who intercede between the artist and the viewer to explain art and cannot. Beuys was a visionary, and his vision was extraordinary, unique. But he also possessed gifts of communication that, while they could never wholly explain his vision at least were fascinating enough entice viewers, dead or alive. Beuys’ 1985 installation Plight was an important show for me – it made me realise what potentially could be done and how narrowly we had all been thinking. Yes, there had been performance and installations before, but this was a mature work not some lazy ephemeral event. It had deliberation behind it and it had a distinct atmosphere that I can still recall vividly even after all this time. Very very few exhibits have ever affected me as much. 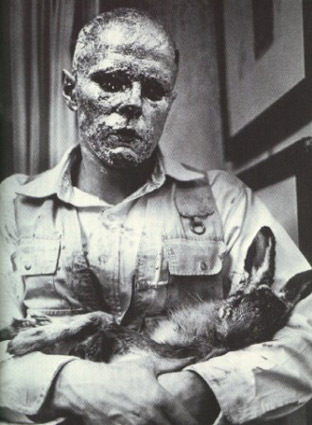 So I am that hare, mute and limp in Beuys arms as he lovingly, but implacably holds art in front of my unseeing eyes. I can never repay him, never thank him, perhaps never even understand him – but his work is to explain art to me nonetheless. This entry was posted in Art, Art Education, Auctions, Galleries, London, Modernism, Painting, Performance, Uncategorized and tagged 1980s, Animals, Art, Beuys, Galleries, London, Performance, Sotheby's, West End. ← Art makes my eyes hurt.